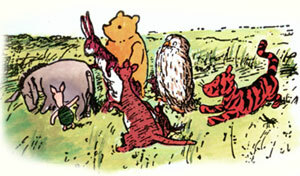 hich character in the Hundred Acre Woods shares your personality? Write down the letters W, P, E, T, K, R, C, B and O. Put a tick mark next to the letter each time you choose an answer that corresponds to it. Then, use the guide at the end of the quiz to find out your "poohsonality". 3. You forget a friends birthday  what do you do?